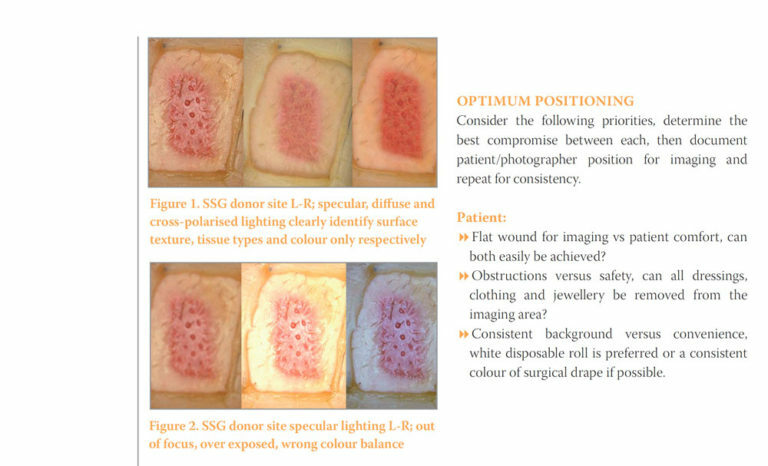 Wound condition and research outcome can only be demonstrated if captured and presented accurately, this article highlights best wound imaging practice, with a view to avoiding those inconsistencies regularly observed when wound care professionals present or publish their work. Consistent image capture and standardisation techniques, in conjunction with presentation image alignment and scaling are demonstrated in a practical and simplistic fashion, so allowing all to reveal their work in the clearest possible fashion. Mobile capture devices such as phones are not recommended, their convenience is off-set by a lack of image quality and security; devices are easily misplaced, are subject to auto back-up and operate outside the controlled hospital networks. Image storage should always conform with local hospital guidance, if in doubt contact your Medical Illustration Department. Ensure all applicable image details, including the level of consent, are associated with the images — databases, departments and staff change but the images will remain. Consent to images should be documented and evidence retained with the resultant images. The level of consent must reflect the intended uses for the life-time of those images, otherwise re-consent accordingly. Note, if images are published on-line it is impossible to fully control. image circulation thereafter — if applicable, patients must be informed of this prior to consenting.